Kim has been an endorsed coach with top international vocal technology company TC Helicon since 2007 being a ‘Vocal Coach in Residence’ twice for their popular Voice Council Magazine. She works regularly at the legendary Abbey Road Studios leading their exclusive “Record a Song” sessions and was part of the coaching team on the UK Audition Tour for Series 3 and 6 of “The Voice UK”. 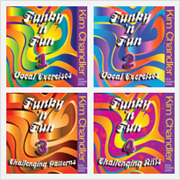 Kim’s vocal pedagogy writing features in two internationally published books: The Ultimate Guide to Singing and Teaching Singing in the 21st Century. She also has a keen interest in the latest voice research, methodologies and pedagogy and, in addition to extensive reading on the subject, attends regular ongoing training [read more]. Because of Kim’s dual working life as a session singer and vocal coach, she has the perfect combination of skills and experience to make her very useful in helping artists to lay down their best vocal takes in the recording studio. If a vocal technique issue arises, then she draws on the coaching side; conversely, if it’s a musical or interpretive issue, then she draws on her decades of session experience. She also speaks the ‘language’ of the producers which can be different to that of the singers and vice versa, making her the ultimate ‘translator’. Kim was the "resident" vocal coach for the Cristo Foufas show interviewed live on LBC 97.3 each Sunday evening throughout Oct to Dec 2009 for her expert opinions on the "X Factor" live shows. Kim coached the finalists of this prime-time GMTV competition and subsequently the winners in the recording of their album through Universal. Kim was one of an elite team of vocal coaches brought in to help the contestants prepare their songs for BBC1’s prime-time series featuring celebrity duets. Kim’s vocal coaching expertise was featured on ITV’s prime-time Saturday night series as one of a team of 5 “makeover” experts. “The One and Only” – KATY WON! One of Kim’s private clients, Katy Setterfield, won the BBC’s prime-time TV competition “The One and Only”. Kim was invited to screen test as a vocal coach on the show which is how Katy found out about it. She sang her heart out week after week as Dusty Springfield and went on to star in the "Legends" show in Las Vegas. Congratulations Katy! Kim was the proof-reader for the latest English edition of the ground-breaking vocal text "Complete Vocal Technique" by leading Danish vocal coach/researcher Cathrine Sadolin. Cathrine is one of a new breed of evidence-based coaches with the courage to explore and teach all voice qualities including those previously thought damaging to the voice, i.e. vocal distortion. She also invited Kim to conduct a day-long vocal masterclass at her "Complete Vocal Institute" in Copenhagen in December 2008.